Okay, it was really just a week in Oklahoma but it was as hot as hell. It’s been far too long since I lived there and I am not used to high humidity and 100+ degree temperatures. The purpose of the trip was to visit family. I worked during the days, safely sequestered inside the air-conditioned house. The dogs only ventured outside for five-minute periods to pee before deciding to head back in the house. They slept a lot last week. In the evenings we did family things such as dinner at Ponca City’s finest chinese-style buffet restaurant [note: it was awesome to hear the chinese staff say things like “Follow me to your table y’all.”]; watching television; and swimming in the pool. Fabi loves swimming in the pool and would repeatedly jump in and splash whomever was looking too dry. At one point she slipped a bit and hit her rear on the side of the pool, spraining the muscle that holds up her tail. It’s better already but it certainly didn’t stop her from jumping in the pool again and again. Lucy, on the other hand, was not interested in swimming. She’ll dive into an ice-cold mountain river and fight the current but my guess is the very warm water (92 degrees in the evenings) and the chlorine smell convinced her it was more fun just to stand at he edge of the steps and attack Fabi every time she climbed out of the water. As we fueled up before heading back yesterday morning, even though the dogs were riding in the back seat of the truck cab (air-conditioned since it was too hot for them in the back under the topper), I realized that heading north through Kansas would let the morning sun shine directly in the passenger-side windows and effectively reduce the amount of usable space in half. 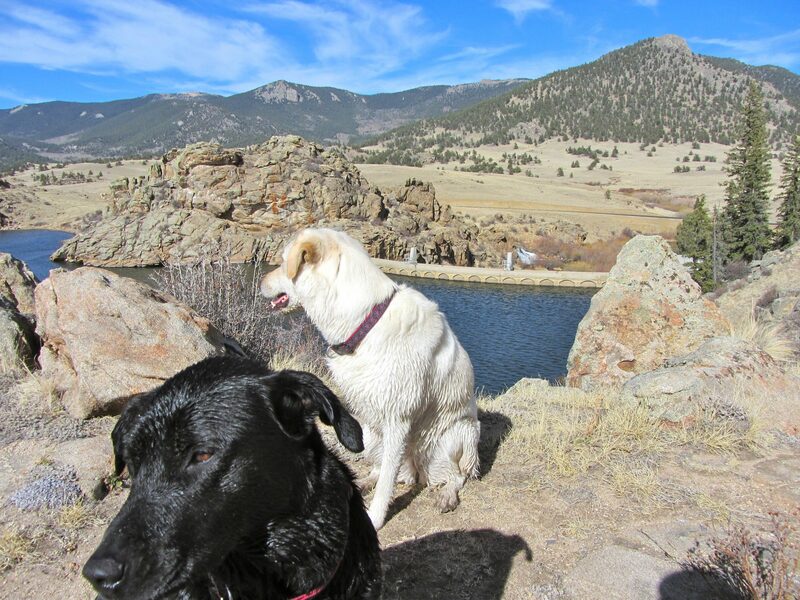 The dogs get too hot with the sun shining on them, so I decided to take the southern route back home to Denver. We drove west from Ponca City through northern Oklahoma to the panhandle. The temperature hovered around 100 degrees until we were near Guymon where a rain shower cooled things down into the lower 80’s. As we entered northeast New Mexico we caught up with some monsoon thunderstorms that lowered the temperature into the 50’s at altitude. It was a great trip home.